The House of Cards… No, not that one. The other one. I knew it. I knew I recognized it but I was enjoying it so much that it completely blinded me to the memory of the original. House of Cards, the new Netflix original series that I have been so excited about for the last week (And it is phenomenal. Seriously, I think everyone should watch it.) Is based on the same source material as the fantastic, although slightly dated, House of Cards (called The House of Cards in the Netflix cue) that was released in the 80’s by the BBC. Both are similar, main character breaking the 4th wall to speak with the audience, and have the same general plots, spurned House whip getting revenge on the people who wronged him, but the styles of the shows are significantly different and there is the fact that the original takes place in England while the Netflix series takes place in the United States. 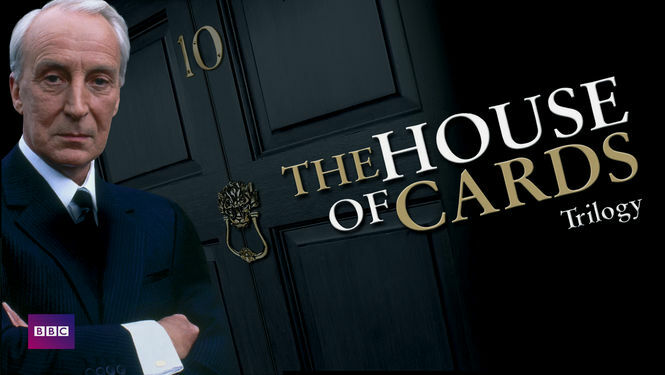 Here’s some info on the BBC series, in case you’re curious – The House of Cards. Clearly the Netflix series is based on this series, of which there were three seasons, but they each have their own charm and both worth watching in their own right. Also, the stories do diverge, especially considering the ending of the original series in the UK, which is always nice. I’d hate to have a road map to the entire new series already laid out – talk about spoilers! I have finally finished the Netflix version and want to discuss it! Maybe a G+ hangout? Mention in the comments if that would be something you’re into.